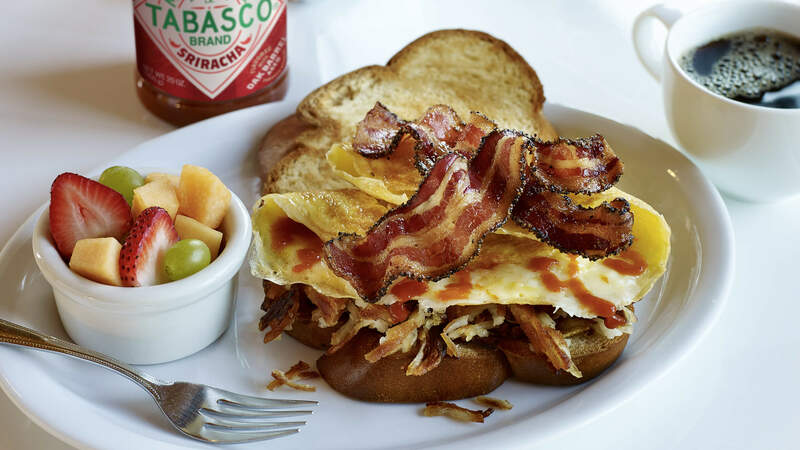 Pack a punch at brunch with this Sriracha Breakfast Melt, a spicy drizzled, open-faced egg sandwich. Breakfast sandwiches remain a classic breakfast and brunch offering, but continue to increase in menu penetration (up by 36% over the past 4 years). Pepper bacon strips, fully cooked --- 8 ea. Challah bread, sliced --- 8 ea. Whisk eggs; pour into frying pan on medium heat. When halfway cooked, drizzle on TABASCO® Sriracha Sauce and sprinkle in shredded cheese. When nearly fully cooked, fold into four sections. In skillet over medium heat, cook hash browns until golden brown. Layer eggs over challah bread with hash browns and bacon, and serve.